Lloyd David Ittel was born on December 16, 1918 on the family farm on Krucker Road in Butler County, Ohio. He died peacefully on November 23, 2018. He was pre-deceased by his wife, Alberta, and his brother, Maurice Ittel. Lloyd went to school at the Hanover Township School and then he attended Miami University where he got a BS in Education in 1939, and lettered in Cross Country. He became a teacher and coach at Clinton High School in Clinton County, Ohio. Lloyd was a pilot in the Army Air Corps during World War II, which became the U.S. Army Air Force in 1941. 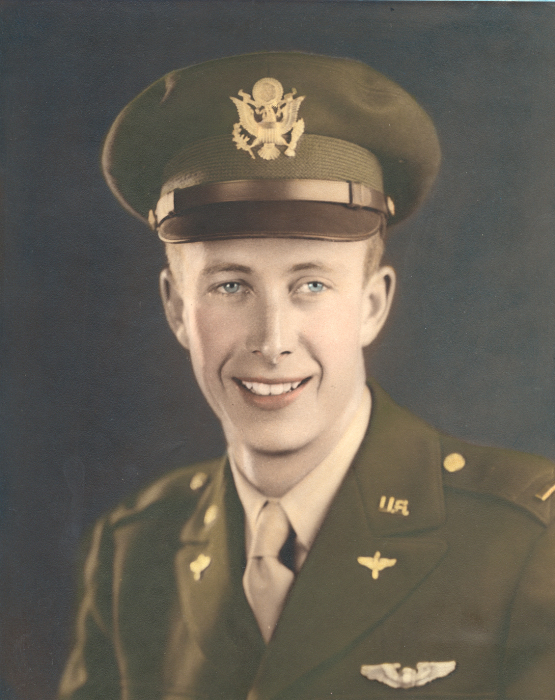 He flew over Germany, and in 1944 his plane was crippled by German fighter fire over Berlin. It was clear that they could not maintain altitude. The crew reached the North Sea where they ditched the crippled B-17G. After completing his 30th run, Lloyd manned the base control tower, helping other crippled planes to land. He received the Distinguished Flying Cross and is the proud holder of a Flying Goldfish patch, the award for those who have survived a ditching at sea. Lloyd married Helen Alberta Lutz in 1947 in Lewisburg, Ohio. Lloyd and Alberta built a house on Chestnut St., on the SE corner of Miami University’s Land Grant square mile. Later, they were founding members at The Knolls, a retirement community in Oxford. Alberta was on the Music Faculty at Miami University where she taught piano. Lloyd joined Ohio Casualty in Hamilton as a Contract Bond Underwriter. He was an avid golfer and a "basement carpenter" making wooden games and puzzles. He maintained a large vegetable garden and was a sweet corn specialist. Interment will be private. There will be a “Celebration of Lloyd Ittel’s Life” at the Knolls on what would have been his 100th birthday, Sunday, December 16th from 10:30am to 12:00. In keeping with Lloyd’s wishes, there are to be no flowers. Lloyd supported a number of charities, but anyone wishing to make a contribution may send it to the Alberta Lutz Ittel Music Education Scholarship fund (#2800-001) at Miami University, Gifts and Records, 926 Chestnut Lane, Oxford, Ohio 45056.